Concern about the violence of the sport and the lasting harm to players continues to garner attention. Studies linking football to long-term degenerative brain damage, allegations of bounties paid to players who injure opponents, and suicides of current and former players have many parents questioning whether they should let their children play football. Also read: Is the future of football in jeopardy? 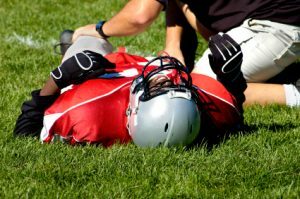 Just as there is disagreement among current and former players, coaches, and fans over this question, there is also debate among healthcare professionals and sports medicine experts. I polled some experts for their opinions. It if it were my child, I’d never let them play football. No way. For my boys, the risks are too large, the sentiments too cruel, and the gains simply not worth it. There are plenty of other sports teams out there to grow, exercise, form friendships, and excel. I never want my children to be a part of any institution that houses intent to harm another human being. Although direct harm may not be a tenet in peewee football, we all know that young sports teams are built to emulate the pros. If the NFL is the inspiration, for now, count my boys out. Playing football certainly increases the chances of extremity injuries as well as concussions. I’ve seen so many football injuries in my career that it really does make me think twice about letting my kids play. At the same time my viewpoint is skewed because I only see the injuries. Overall most kids on a football team remain injury free. So yes, if my children were passionate about football, I would allow them to play as long as they were not getting repeatedly injured. I would not allow my children to play if they suffered a single concussion. I would also shut them down if they endorsed signs of cumulative trauma. If I had a son, I would steer him towards other sports. The key issue is whether children can really give “informed consent” for sport. I don’t think they can, so parental judgment will have to supplement the child’s preferences. Once a kid is mature enough to take on responsibilities like driving and voting, if they remained passionate about football, I’d make sure they know the apparent risk, but they’d receive my support in their choice. Football has much to offer but also comes with significant risks. When he is old enough and mature enough to understand these risks and make an educated decision then I would let him play. However, I truly believe that the long-term cognitive decline consequences of playing football are not due to a few concussions but rather due to the repetitive sub-concussive hits to the head that occur on a daily basis. Therefore, I would STRONGLY recommend that he not play lineman, linebacker or running back. Also read: Big hits, broken sport? I’m sure a lot more data will come out before I am confronted by this decision, and hopefully effective new safety measures will be instituted. Right now, though, I would say that I would not intentionally steer him to football but I would not specifically prohibit him from playing. Not that I wouldn’t be nervous every time he took the field to some degree, but if he came to me and wanted to play I would let him. I enjoy watching football, but I think the current state of the game is that hard hitting, hard tackles, head injuries, and other chronic residual ailments are so commonplace that I would steer them to other sport options. There has been some progress in terms of equipment, changes in rules, shifts in focus in coaching, but for my own kids, I would prefer other ways for them to get exercise and learn teamwork. If their choices were between football and being an obese couch potato, that would be different. However, they have so many great sports and activities to choose from. What do you think? have you considered keeping your kids out of football or steering them to other sports? Do you feel that these worries are unnecessary and would allow or encourage them to play football? Share your thoughts below! Should schools eliminate football? 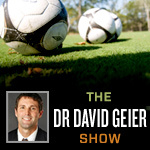 In the Zone segment from Episode 59 of The Dr. David Geier Show. Note: A modifed version of this post appears as my sports medicine column in the February 1, 2013 issue of The Post and Courier. I adapted it from a post I wrote several months ago that has the full quotes from these experts and several others.